The raspberry jam with lemon from Menton is another innovative creation by Aix & Terra. 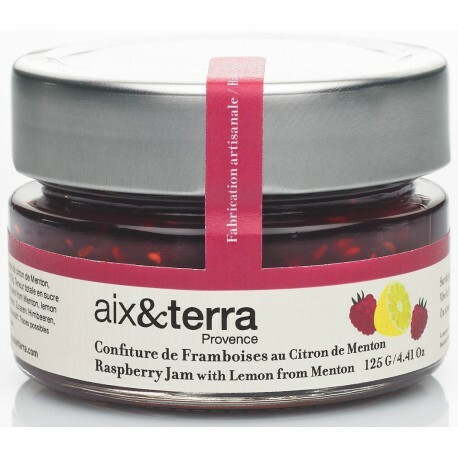 The sweetness of the raspberry is married to the acidity of the lemon for an original jam. We recommend it on toast, bread, croissants, scones and muffins. Aix & Terra is located on the famous nationale 7, one of the most culinary destinations of the Provence. The company was founded by Richard and Marina Alibert. From a passion for taste and natural produce, the couple swapped their Parisian life for a beautiful gastronomic adventure. Together with Julien Allano, they partnered up with small fruit and vegetable producers to develop original recipes to bring you the best cuisine from the South of France.